My modern conservative Christian mind has trouble with David and all of his wives. Then, I read about his affair with Bathsheba and the plot against Uriah, and I don’t understand how God could’ve chosen this man for such an important role. Yet the Bible says David was a man after God’s heart, so despite his flaws, David was right with his God. And I'd be wise to learn from his example. Um, hello, David. Bathsheba and Uriah were majorly affected. What about them? The people-pleaser in me would have a hard time praying the same prayer as David. That part of me would demand I focus more energy on rectifying the situation with people than with God. After all, God forgives. But people? That’s shaky ground. 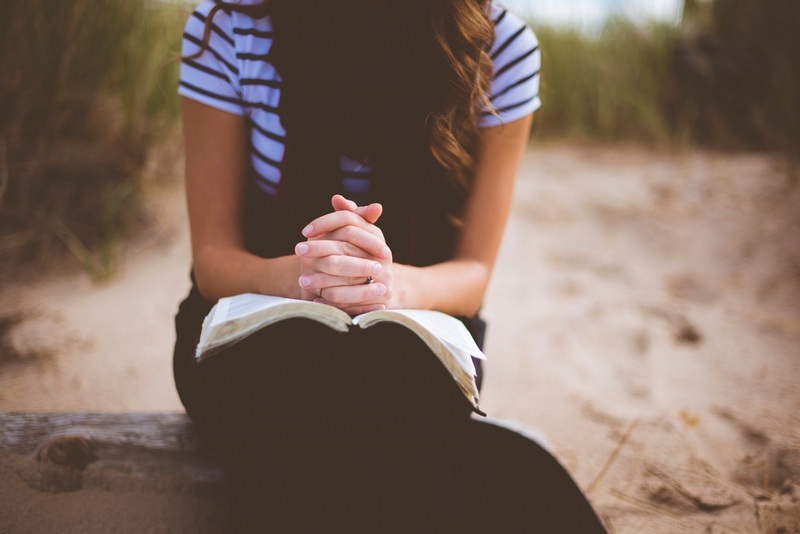 David’s prayer, however, shows he was most concerned about pleasing God. And though we must care for human relationships and seek forgiveness, pleasing God should also be our number one concern. Repentance is something to be treated with reverence, not a flippant attitude of "God forgives, it's all good." God is holy. God determines right and wrong. Our sin shows a disregard for him and for that which he created. This is serious business, and we'd do well to let David remind us of this. Though David did turn to God, repentant, the child conceived during the affair dies as a consequence of David’s sin. David intercedes for the child, but once the child dies, David picks himself up. He knows his heart is once again right with God and there’s nothing more he can do, so he accepts grace and moves on. He doesn’t dwell in regret. And maybe that’s the biggest shock of this story for me. Not only is David not overly concerned about pleasing people around him, he’s not beating himself up for his failures. How could he live with himself? How can I learn from him to move on after I fail? 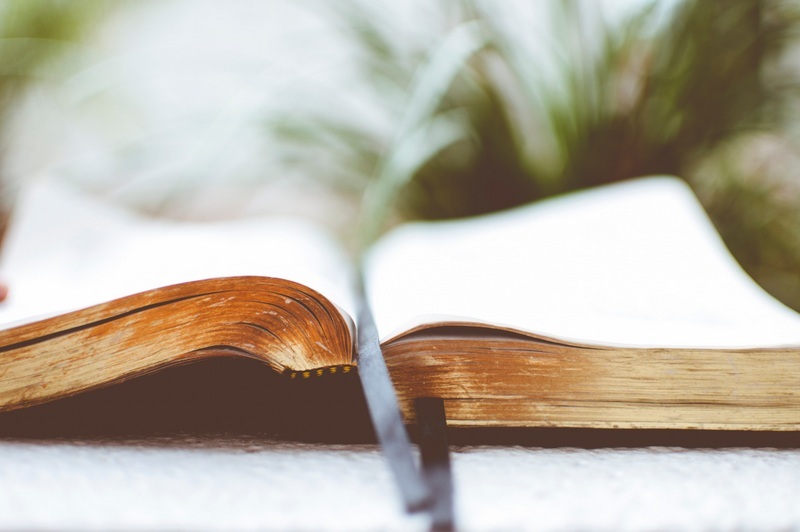 David focused on God, and God forgives perfectly. When we’ve displeased a person, even if we’re sorry, it usually takes a while to get back in their good graces. Maybe that’s why so many people-pleasers are perfectionists. We know any misstep will cost us our coveted audience of pleased people. We feel guilty and unqualified for the work of God. And in our pain, we judge others, deeming them unqualified as well. But when we bow our hearts before God for forgiveness like David did, we are completely and utterly forgiven. Forgiven, we’re free to move on. Then, rather than guilt, grace determines our next steps. When we accept grace, we are better able to extend it to others, something we’ve been given great power and responsibility to do. Something else we can learn from David. When the prophet Nathan confronted David with a story paralleling the situation with Bathsheba and Uriah, David said the guilty man deserves to die. But then David assigned a different punishment. He was going to show mercy, even before he found out he, himself was the guilty party. Next, Nathan then tells David that God is sparing him from death but that there will be other consequences. I wonder if this is an example of God forgiving us as we forgive others. David's story is challenging for me because it convicts my perfectionist, people-pleasing ways. I want to be a woman after God's heart. 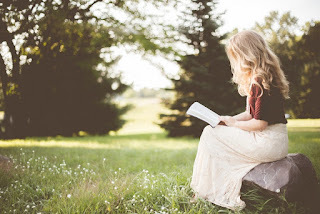 I don't want to waste my life chasing anything less, and David's story shows me quite clearly some areas where I have a tendency to substitute people-pleasing for God-pleasing. We must seek God’s heart, first and foremost. When we sin and repent, He offers perfect forgiveness to free us from guilt. And we are to extend that to others as we live lives focused not on pleasing people but God and God alone. P.S. 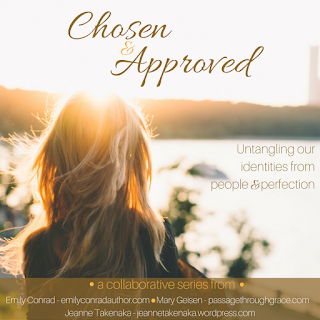 This post is part of the Chosen and Approved series with Jeanne Takenaka and Mary Geisen. Check in on Tuesdays through November 8th for the latest installment as we join forces to untangle our identities from people and perfection. You can read all the posts here. P.P.S. I don't normally include attributions for the photos I use in my posts because if they're not mine, I've gotten them from a Creative Commons Zero site. However, I was thrilled to find Christian photographer Ben White, whose photographs appear in the body of this post, on Unsplash.com, and I wanted to let other Christian bloggers know where to check out more of his work. 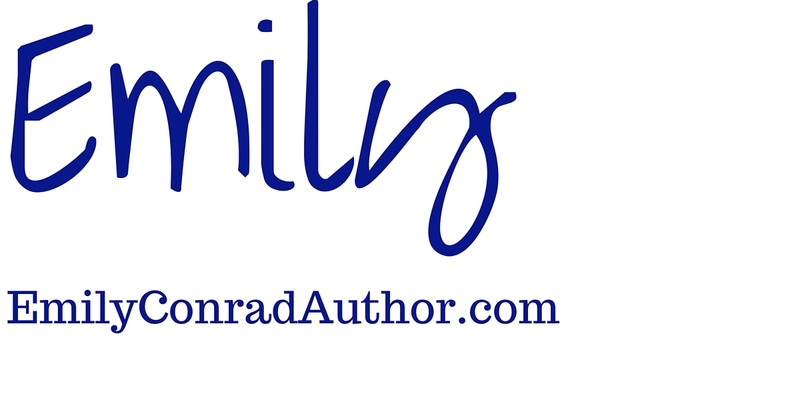 Hi, Emily, I'm here from Jeanne's site. Some things that we do are indeed not fixable; negligence on my part has resulted in the death of a very beloved dog, and finding forgiveness for yself, in my own heart, has been tough. Belay that. It's impossible. I move on with a fish-hook embedded deep in my soul, calling me to look back to my error. And to never make an error like that again, because in this life we play for keeps. I believe that God forgives me, but I don't want to lose the immediacy of the lesson. And I want to be loyal to my sweet canine friend, whom I so badly failed. I'm so sorry about your dog. Sometimes forgiving ourselves is hardest of all. Learning from the past is wise, but may God's forgiveness also help you to extend yourself grace where it might be needed. I agree; Uriah certainly was a hero! Thanks for visiting! I needed to read this because in my situation I still sometimes do not feel forgiven because I'm focusing on people yet God has forgiven me thank you for highlighting this. Also this sermon is incredible if you need to forgive someone or if you need to be forgiven yourself so many powerful truths. Hi Emily - visiting from Jeanne's today. I agree, this is one of those parts of scripture that truly awakens my strong sense of justice. There was so much devastation and brokenness, but SO MUCH grace. David's capacity to embrace, believe, and engage in faith - to repent and then let go - is truly astounding. Perhaps if I had a prophet lay it out for me? ;) David's life is such a testament to the fact that no matter the mess, God's plan for redemption is greater. So enjoying this series and your insights. Blessings! Andrew, your comment is along the lines of what I was going to say to Emily, too. Thanks to negligence on my part, one of my dogs, just a puppy, was badly injured. The guilt that I felt over the injury and my puppy's pain was overwhelming. I felt like I couldn't live with myself for days and truly wondered at one point how I would have been able to live with myself for the rest of my days if instead the injury had led to his death. My heart bleeds for you, Andrew, and what you're going through. I've had a taste of it, and I can imagine the horror of trying to live with that kind of guilt. But my family and friends (Emily included) were there to remind me that God forgives me. 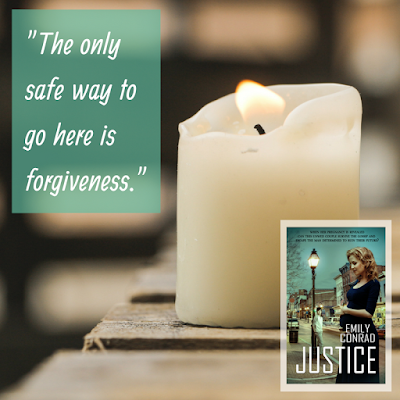 I know you know that, too, but what I realized I wasn't seeing as I clung to my guilt was that His forgiveness is enough. I didn't see the fault in my attitude until God finally showed me. If God can and does forgive me, who am I to say that I shouldn't be forgiven by myself? Am I greater than God? No, that's not what I consciously thought at any point when hanging on to guilt, but I confess that's what I was doing regardless. If God can forgive me, then I have no business or right to say I shouldn't be forgiven. To punish myself. It seems that's the truth that David understood so well, the only way he could have let go of the guilt of being responsible for the death of his own baby boy. "If God can forgive me, then I have no business or right to say I shouldn't be forgiven" - Amen! And not only "can" he forgive, but he is faithful and just to do so when we turn to him. Thanks for sharing your wisdom and experience, Jerusha! Such truth! We can't calculate the true cost of our sins, but we have a God who has paid the debt and wants us to receive his love. Yes, yes, yes. Thanks for visiting, Tiffany! So thankful that God's plan and love certainly are greater than all our messes. :) Glad you're enjoying the series! I'm also visiting from Jeanne's place today. I am a member of "people pleasers anonymous" (or would be if such a group existed). There is something so freeing when we live our lives to an audience of One. I still fall back into some of my old ways - I don't like it when I upset others or can't manage to keep everyone happy, but I'm getting better at realizing that's not my job. I can't keep everyone happy, but I can concentrate on walking in obedience to God. I also used to think that there was something redemptive in continuing to beat myself up after asking for forgiveness. I've since learned that this is a sense of pride creeping in. In essence, I'm saying that what Christ did to satisfy my sin is not sufficient - I have to do something more. Nothing could be farther from the truth. God sacrificed His Son so that I could live in freedom and not regret. Really enjoyed this post! Emily such a thought-provoking post. The thought of pleasing God before pleasing (or appeasing) people challenges me still. I need to remember David's example in this and look to God first, and people second (if at all). You're right that we can't keep everyone happy, and it's exhausting to try (I would know ;) ). I think a lot of us are also tempted to beat ourselves up after God has already paid for and forgiven our sin, but you're right that there's nothing redemptive in that. Nicely put! Jesus died so we could live in freedom and not regret! Thanks for stopping by, Bev! I love this series the three of you are doing, Emily. Thank you. My heart cries with yours - "I want to be a woman after God's heart. I don't want to waste my life chasing anything less..." Blessings and hugs to you! So happy to be doing this series with you, Jeanne! I love that you added "if at all" in there. Sometimes, people's opinions draw us from God and aren't something we should even glance at. Thanks, Trudy! Glad you're enjoying it! Thanks for reading along! Thank you for this insightful post. Just last night I stood in the shower lamenting my repeated decision to go over and over my sins. Oh how right you are to point out the connection to people-pleasing. I hang in the shame of my sins, even though I've confessed them, because I am focusing on the disappointment of people in me and my own disappointment in myself: as if I'm too "good" to commit sins, instead of resting in my Heavenly Father's goodness and grace. I'm still letting my old mindset (one based on an angry, pointing the finger god, a god of human shaping) cripple and enslave me. As I stood in the shower, God brought my One Word for 2016 to mind: Behold. And I heard Him ask me: "Will you choose to behold me? To look in my face and see My love for you?" I have such a hard time forgiving myself and in turn wonder if God forgives me. At the same time, as a Christian, I know God forgives. I know that struggle, and I'm so glad God met you in that. He loves you so deeply and died to set you free. Thanks so much for visiting! It seems that people-pleasers are uniting throughout the comments today. What I love about this post is how you highlight David to remind us that ultimately, even as messy as his life was he still looked to pleasing God as his first concern. When I read about David, my mind takes me to his faults rather than the fact that God always has a reason he chooses someone to do His work. Great words and lessons of repentance, grace and mercy. 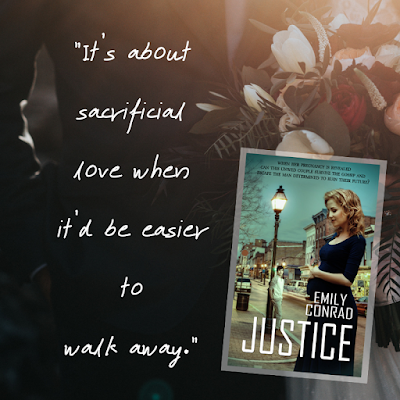 The love of a lifetime, a quest for justice, and redemption that can only be found by faith. When her pregnancy is revealed, can this unwed couple survive the gossip and overcome the man bent on destroying their future? 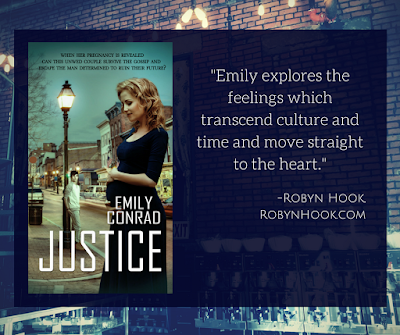 Click the cover image to learn more about Justice! Scripture and/or notes quoted by permission. Quotations designated (NET) are from the NET Bible® copyright ©1996-2016 by Biblical Studies Press, L.L.C. All rights reserved. 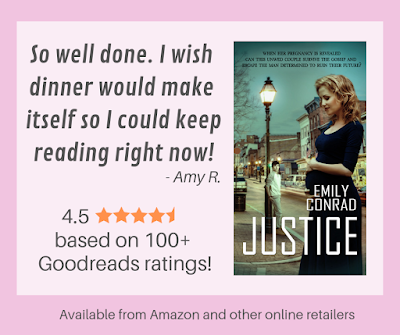 Emily Conrad is a participant in the Amazon Services LLC Associates Program, an affiliate advertising program designed to provide a means for sites to earn advertising fees by advertising and linking to amazon.com.